The Hari Mandir or Golden Temple is the holiest temple of the Sikhs as it contains the Adi Granth, the original Sikh holy book. The Sikh religion was founded by Guru Nanak in the early 16th century and the Adi Granth was compiled under successive Gurus. 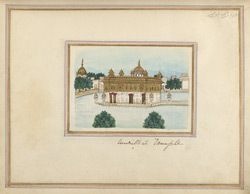 The Golden Temple dates from the 18th century and was added to in subsequent generations. It stands in the middle of the Amrita Sarovar, a large rectangular tank; Amritsar means 'Pool of Nectar' and the name refers to this tank. The exterior of the building is made of marble and is completely gilded with gold leaf while the interior is adorned with inlaid marble, carved woodwork, ivory mosaic and embossed gold and silverwork. Surrounding the tank is a large complex that includes offices, stores, a dining-hall and kitchen, guesthouse and watchtowers.